Amy Einhorn Books, 9780399160219, 275pp. "If you loved "The Girls' Guide to Hunting and Fishing," this book is right up your alley." --Isabel Gillies, "New York Times"-bestselling author of "Happens Every Day"
Sometimes what you want in your twenties isn't what you want or need in your forties. . . . When Lucy Lovett's husband loses his job, she is forced to give up her posh life in London and move their family to a tiny apartment in Manhattan, where her husband has managed to secure a lowly position. Lucy finds herself living in the center of cool and hip. Across from their apartment is a trendy bar called PDT--whenever Lucy passes by, she thinks, "Please Don't Tell anyone I'm a middle-aged woman." Homesick and resentful at first, Lucy soon embarks on the love affair of her life--no, not with her husband (though they're both immensely relieved to discover they do love each other for richer or poorer), but with New York City and the three women who befriend her. There's Julia, who is basically branded with a Scarlet A when she leaves her husband and kids for a mini nervous breakdown and a room of her own; Christy, a much older man's trophy wife, who is a bit adrift as only those who live high up in penthouses can be; and disheveled and harried Robyn, constantly compensating for her husband, who can't seem to make the transition from wunderkind to adult. 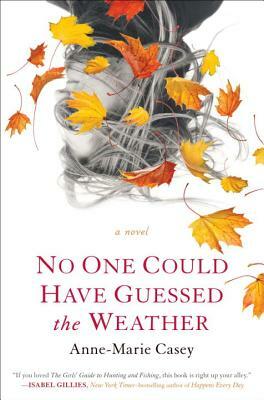 Spot-on observant, laugh-out-loud funny, yet laced with kindness through and through, "No One Could Have Guessed the Weather "is a story of what happens when you grow up and realize the middle part of your story might just be your beginning. Anne-Marie Casey was a script editor and producer of prime-time television drama for ten years before becoming a writer full-time. "No One Could Have Guessed the Weather," her first book, was inspired by her time living in Manhattan and her love-love relationship with the city. She is married to the novelist Joseph O'Connor. They now live in Dublin, Ireland, with their two sons.